Filled Raspberry Candy - 14 oz. Remember the magic of this old-fashioned raspberry candy? 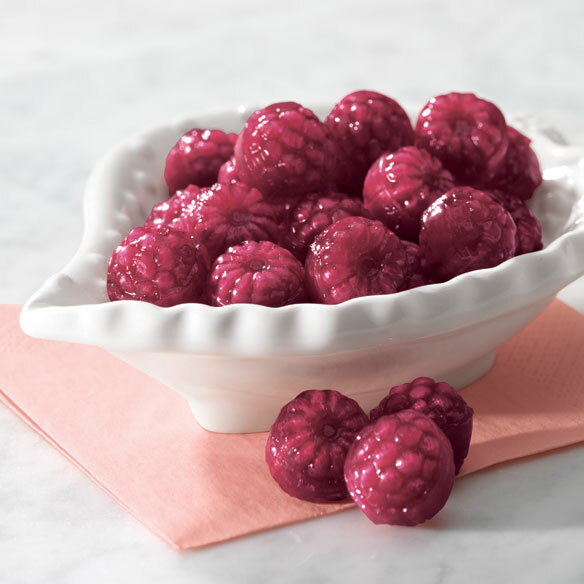 Did you let them melt in your mouth, or crunch through the sweet, glossy shells, getting straight to the soft raspberry centers? Maybe you need to try raspberry filled candy again ... because any way you savor this sweet old fashion candy is perfectly wonderful today! 14 oz. of raspberry filled candy. This product is truly addictive. Very flavorful. Have to have these a Christmas time, long time favorite!! The only thing I didn't understand about these was how sticky they got after they were out of the container. I have a second bag & will be sure to keep them in a sealed container after opening the original one. But, they are yummy and aren't as bad as some other candies. I used to only buy a National brand, one that only came out at Christmas time, but when I did this year, most of the bags were full of raspberries that didn't have soft centers, and that's the part I look forward to getting to. Yours are ALL soft centers and I will only buy yours from now on. I could not find this candy for the longest. It's a very old Christmas candy and I love it. These were put in a big candy dish and were enjoyed all through the holidays. I snack on them when I'm on the computer. Love these. Glad you sent me the candy book. I have loved this Candy since I was a kid, it used to be made by Brachs and was only available at Christmas. I order it every year and I am thankful that I can still get it. I try and buy quite a bit so it will last but it never does. Thank you Miles Kimball. Every bit as good as I remembered. Sweet and tart. This candy took me back a few years to my child hood. Was a wonderful treat and was gone in a week. these little gems remind of my grandfather, whenever I visited, I remember sitting on his lap and he would sneek these out of grandmas 'sweets box' and we would enjoy these together. I am so glad someone still offers these. Great taste can't put them down! These are filled with great taste in every bite! I love to snack on these candies, not too many at a time. I remember them as one of my favorites as a child and was very excited when I saw them in your catalog. I find it interesting that they taste like a fresh raspberry, but there is not one raspberry in the ingredients. They are made with apples of all things. Great job!!!! I dream about these candies because they were my favs as a child!!! Susie q:the raspberry candy eater! I love Miles Kimball and have been buying from them for many, many years. Fast service and everything as described. Please sir-I want some more! brings back my childhood! don't ever stop carrying them! my sister and I LOVE them!!! My Nana always had these when I was growing up and I loved them - so happy to find them again. They are just like I remember! I will buy this product again ! My son loves these candies. It's a way for me to say HI and I Love You to him anytime I want to! He is most appreciative and LOVES these candies since he was a young child, he is now 31 and still loves them! MY GRANDSONS LOVE THIS CANDY!!! Price was great and taste reminded me of my childhood days! Will definitely have to buy more! The whole family loved these! They reminded me of the Christmas candy my grandmother had. When I was young my Grand Mother always had these in a candy dish! I have a friend been looking for this candy she loves it. As a gift to my son. He loves these candies and they are hard to find. I like the fact I can have them mailed directly to him, saves me extra postage! Filled candies are hard to find(especially good ones)Was happy to find these...How about some different flavors??? I use it when my mouth gets to dry from talking . THESE ARE MY FAVORITE CANDIES SINCE CHILDHOOD, BUT NOW THEY BARELY HAVE A HALF DROP OF JELLY. WISH THEY DON'T TRY TO SAVE BY NOT MAKING THEM AS THEY USED TO BE, CAUSE THAT'S THE BEST PART. I thought these would be like I remember, but the flavor is not as good. Also they stick together. The quality is just not here. This order has not yet been received, although it was ordered almost a month ago. IT IS THE 19TH OF DEC AND I HAVE NOT RECEIVED THIS YET. I WOULD NEVER RECOMMEND MILES KIMBALL FOR ANYTHING. I could not find these at Christmas and they are my favorites. They have the right flavor, but the centers are not soft like they should be. When they arrived, they looked like a film was over them. They are not shiny like new candy should look. Will not be able to put them out for guests. However, at least they tasted okay.